The Don David range are the flagship wines of the Bodega El Esteco estate named in homage to the winery founder David Michel. Terroir: Each selection in the Don David range is sourced from entirely estate owned vineyards throughout the Cafayate Valley. Vineyards sit at elevations well above 3,000 feet with many sitting above 6,000 feet. The power of the sun at these elevations combined with very little moisture or pests leads to wines of unique purity and concentration. Vinification: Concentration and varietal expression are the goals of both the red and white wines in this range. The red wines undergo a 5 hour thin covering maceration which extracts additional concentration followed by more than a week of cold maceration in steel tank and 9 months in the cellars in a combination of French and American oak. 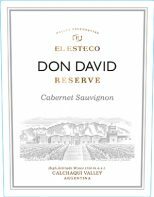 The 2016 Bodega El Esteco Don David Cabernet Sauvignon shows spicy red pepper and paprika aromas with smoky tobacco notes. In the mouth there are firm yet elegant flavors of blackberries, morello cherry and pepper before a long, elegant finish. "(13.9% alcohol; aged for 12 months in new oak): Bright red-ruby. Aromas of cassis, black cherry and peppery herbs. Dry, savory and penetrating, conveying good intensity to its nicely delineated flavors of dark berries, spices and pepper. Finishes with firm, well-integrated tannins. There's a distinct Cabernet herbal character here but it's nicely countered by strong crushed-berry fruit. This energetic wine is in the same quality league as the 2016 Don David Malbec Reserve I tasted last year but may have more of a future." "Finely textured, with flavors of red currant, cherry and plum that are supported by fresh acidity. Savory finish. Drink now." "This is tannic and rich wine with lots of structure. Medium body, savory and intense. Needs two or three years to soften."